Mei Li Wah sells an assortment of dim sum but is best know for its crown jewel: the golden baked cha siu bao. Perfection in a bun is hard to come by, but these little rolls are up to the challenge. Many have hailed Mei Li Wah’s cha siu bao the best bbq pork bun in Chinatown. Do yourself a favor and buy several buns–one for the road, save the rest for later. Formerly known as The Egg Custard King (which remains its Chinese name), this brightly lit corner bakery offers an exhaustive selection of dan ta or egg custard tarts. The classic egg tart is a bite of yellow custard in a pie-like crust. Natalie’s also makes almond, strawberry, honey dew, and banana flavored tarts. 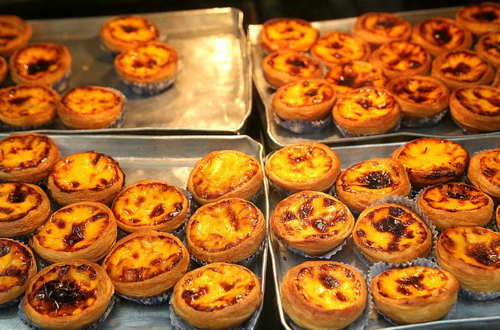 A popular variation is the Portuguese or Macau-style egg tart that is caramelized (like creme brulee) and has a flaky pastry crust. Located in the heart of Chinatown, Tai Pan is a full-service bakery with beautifully decorated cakes and glazed fruit tarts behind glass in addition to everyday fare like raisin bread, pineapple buns, red bean-filled rolls, and savory hot dog buns.